BLURB: Horatia’s plan to join the London literary set takes a dangerous turn. Now that the war with France has ended, Baron Guy Fortescue arrives in England to claim his inheritance. When Guy is set upon in London, a stranger, Lord Strathairn, rescues and befriends him. But while traveling to his country estate, Guy is again attacked. Guy suspects his relative, Eustace Fennimore, is behind the attacks on his life. Horatia refuses to believe her godfather, Eustace, is responsible. Secure in the knowledge that his daughter will finally wed, Horatia’s father allows her to visit her blue-stocking aunt in London. But Horatia’s time spent in London proves to be anything but a literary feast, for a dangerous foe plots Guy’s demise. She is determined to keep alive her handsome fiancé, who has proven more than willing to play the part of her lover even as he resists her attempts to save him. EXCERPT: She patted The General’s nose and fed him an apple. By the time the last of it had disappeared, she heard the clip of a horse’s hooves on the gravel drive. She peeped out of the barn door and saw the baron, tall in the saddle, riding towards the house. Horatia stepped out and beckoned him. He caught sight of her and rode towards the stables then dismounted and led the horse inside. “Sorry, my lord,” Horatia said, adopting Simon’s gruff voice. “We have no footman here. No under-groom neither. I’ll stable your horse.” “Simon, good fellow,” he said warmly. “I came to thank you again. I am indebted to you.” “No need for that, my lord,” she said. “Everything’s right and tight here as it happens.” She turned her back to lead his horse into one of the stalls. Seizing a brush, she bent and swept it over the horse’s flanks. He came to rest an arm on the stall door. “I am relieved. If you had lost your job, I was going to ask you to work for me.” She straightened to brush the horse’s back, confident of the poor light. “Mighty good of you, my lord. But not at all necessary.” “Eh bien, merci encore.” He turned towards the door. Relieved it had gone so well, Horatia stepped out from behind the horse. She looked up to see if he had gone and found him watching her with his arms folded. The elation left her, and she took a deep, shaky breath. “Did you really think you could go on fooling me?” A note of outrage lay beneath the humorous tone in his voice. “How many people around here have red hair like yours?” “My hair’s not red,” she said, incensed. “It’s chestnut.” “I wondered how far you would carry this ruse, Miss Cavendish.” She backed into an empty stall as he strode towards her. He followed her inside. Reaching over, he whipped off her hat, and her hair came loose and tumbled around her face. “So, what do you have to say in your defense?” “Nothing, my lord.” Horatia lifted her chin, her heart pounding loud in her ears. She chewed her lip. She would have to brazen this out. Annoyed blue eyes stared into hers. “I do not like to be toyed with. I thought there was something wrong with me.” “Pardon?” “Watching you bend over in those breeches. Zut! From the first, I felt a strong attraction to you. And then, when I saw you dressed as a woman, I understood.” “You knew it was me at the dance?” She scowled. “And you deliberately teased me?” “Don’t you think you deserved it?” He seized her shoulders and gave them a shake. “You tricked me. Why?” She swallowed. “No trickery, my lord. I was dressed this way when I found you, if you recall. I needed to keep up the pretense.” He shrugged. “But why do you dress like that?” She couldn’t explain her restlessness to him and tossed her head. “I prefer to ride astride.” He raised a brow. “You like a strong beast moving beneath you?” She bristled at the insult. “I like to ride alone.” He made it sound as if she gained some sort of indecent enjoyment from the exercise. Her face heated. To ride astride was unfeminine, she knew, but that fact had never bothered her before. “But to do so places you in peril.” Horatia drew herself up. “I can handle myself as well as a man.” “You believe that, do you?” His gaze flicked over her. What was he thinking? She quivered under his scrutiny. I am an Australian author with a BA in English and an MA in Creative Writing. My lawyer husband and I live in a pretty, historical town in the Southern Highlands with our spoiled Persian cat, plus the assorted wildlife we feed: chickens wander in from next door and give us lovely eggs, ducks swim in our pool, parrots and possums line up for bananas and seed. I write historical romance, contemporary romantic suspense and young adult novels. This is definitely a good read for historical romance fans. I really enjoyed Horatia's character so much! A welcome change from some of the pampered brats we accustom ourselves to. Horatia is brave, bold, and very spirited, and very determined to never marry. It is a shame she gets swept off of her feet by the dashing and rakish half Frenchman she rescues in the middle of the road. Love is found is the oddest of places. But Guy carries many secrets and they seem to mount up around him. Will he be able to keep Horatia and save his name at the same time? This book takes you on a lovely journey when it was dangerous to be aristocratic and even more so to be French. It has an interesting turn of events and a hint of a possible sequel. A few stones were left unturned and I would LOVE to learn more about Guy's newly acquired best friend. He was quite fascinating! There is a tour-wide giveaway with this book! The author is offering one lucky commenter a 20 amazon card plus 2 signed copies of her books!! Good Luck!! I love historical romance set in England. The excerpt sounds awesome and the title has me intrigued. This is a new author for me and I'm always excited to read a new authors book. Great post! I've read very few historical romances but this one sounds great! Thanks for the giveaway! I love strong, spirited heroines! anyway..is this INT giveaway ? Thanks for the lovely review! Thanks for all your lovely comments! Good luck! I should add that Taming A Gentleman Spy - the second book in the spy series, features the baron's friend, handsome John Haldane, Earl of Strathairn. It is released in September with Knox Robinson Publishing. 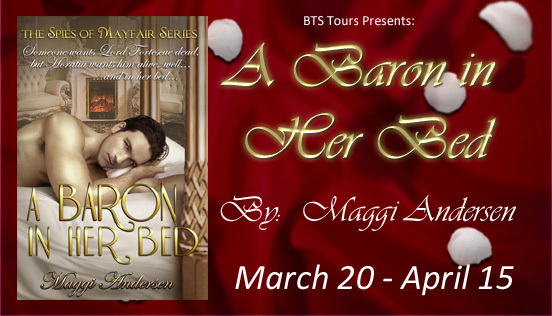 I should also make clear that A Baron in Her Bed is not the giveaway. The giveaway is one of my backlist books including Amazon bestseller, The Reluctant Marquess in e-book. Should the winner choose a signed print book, it is Murder in Devon, a contemporary romantic suspense. Learn more on my website and blog. Thank you all for participating in this enjoyable tour.